Three Floyds Brewing Company could be a stand-in for all that is modern American craft brewing. Brash and playful, big on taste, meticulous in quality, and more than a little bit reliant on spectacle. Like many of the other big-name cult-inspiring brewers, its name has become synonymous with extreme flavors and massive night-ending compositions. Founded by a father and two brothers in 1996, Three Floyds is located in Munster, Indiana, the company is known for its thrash metal/comic book aesthetic and assured brewing and promotional prowess. I’ve been most compelled by their standard Pale Ale offering, Zombie Dust, which in recent months has crept into Beer Advocate’s fickle and contentious Top 10. Zombie Dust’s unadorned, more sessionable style makes it something of an outlier on the list, which is dominated by imperialized, maximalist brews. Sadly – like all Three Floyds releases – it is not distributed in New York, but a trade buddy from Kalamazoo included a bottle in a recent transaction. And so this afternoon, i treated myself to a sniff. Zombie Dust pours a fine deep gold with a nice medium clarity. Healthy fizzy head. The citric hop notes leap out of the glass, tingling the nostrils from even a couple feet back. Bury your schnoz in the glass and you get a deliciously uncluttered earthiness: forest greenery, lemon and mango, vying with the musty-sweet malt beneath. The sharp fruity taste of some pale ales is largely absent from Zombie Dust. There’s definitely the citrus you smelled in the bouquet, but the taste is all earthy, biscuit malting, hints of caramel and honey, and a nice full hop bitterness up front. 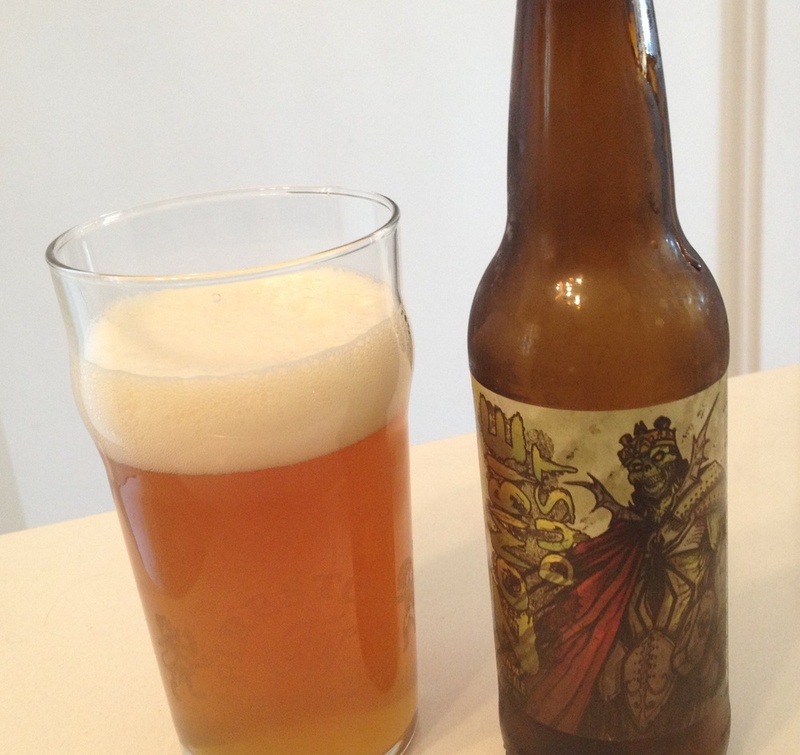 If there is a term for Zombie Dust, it is compulsively drinkable. The interplay of staid biscuit and bittersweet punctuation makes for a robust, invigorating drink. The manageable ABV (6.4%) and a light, crisp mouthfeel makes this the type of brew you could drink with every damned meal. Zombie Dust makes one misty for the good ole’ American Pale Ale. Sure, there are plenty out there, but the IPA and Double IPA seem to dominate the discussion. I’m enjoying the ashy, sweet aftertaste on my tongue, considering the myriad potential pairings for such a remarkably balanced ale (were it available to me year-round) and considering how many cases I could fit in my trunk my next drive through Indiana.